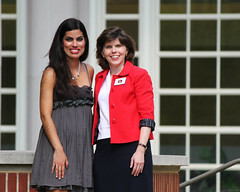 When Pizarro returned to her native Puerto Rico, she realized that she could further her career at Auburn, where she received continuous support and guidance from Davis and chemical engineering faculty members. Davis, who has Hispanic roots, had been working towards the creation of a Society of Hispanic Professional Engineers student chapter at Auburn for several years and wanted to work with a student who would help involve others on campus. Davis said that when Pizarro returned to campus to complete her degree in 2008, she knew Pizarro was the right partner to help make that happen. In addition to forming the organization together, Davis and Pizarro continued their research relationship. While Khristine completed her chemical engineering degree, she continued to work on projects in Davis’ lab, earning a first place award for a coauthored published paper from Sigma Xi, the scientific research society, at the organization’s undergraduate research forum. Pizarro, who graduated May 9, has joined the national chapter of the Society of Hispanic Professional Engineers and will be involved with the regional chapter, which includes Auburn, while working with Chevron in Pascagoula, Miss. The Mark A. Spencer Creative Mentorship Award was established in 2008 by faculty members Samia and Bill SpencerPizarro, and their son Mark, an Auburn engineering alumnus who benefited from having a mentor while a student at Auburn. To be eligible for the award, the faculty member must be a member of the engineering faculty and the student must be an undergraduate enrolled in the Samuel Ginn College of Engineering. The faculty candidate must have a tangible mentoring relationship with a student that focuses on a project directed toward solving a problem or reaching a goal. Ultimately, the enhancement and development of intellectual curiosity and engineering education are the mentoring qualities sought. The annual award totals $10,000, with $5,000 being awarded to the selected faculty member and $5,000 to the chosen student.